Fans of the Osnabrück hill climb race are already enquiring after tickets for the 50th event. Online ticket sales via www.msc-osnabrueck.com will start on 15 January 2017. Day passes for adults and adolescents will be available, as will the popular VIP vouchers, which give access to additional attractions and can be bought online only. Neue Osnabrücker Zeitung will again sponsor a large terrace area for spectators, and for the first time there will also be a stand. Every year, MSC Osnabrück has been issuing a monthly calendar with many attractive images from the Osnabrück hill climb race. In an A3 format, the 2017 edition juxtaposes photos from the early days with those from the last few years, beautifully visualising the development of the event over time. 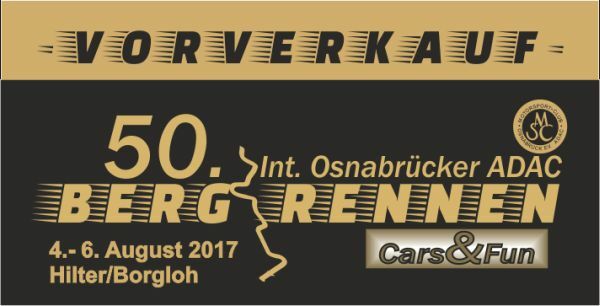 In good time for the 50th anniversary race on 4–6 August 2017, a magnet and a car sticker have also been issued. If you are interested in any of these items, please contact the organisers under presse@msc-osnabrueck.com. 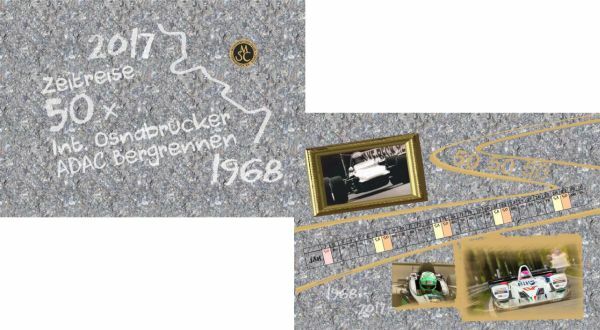 MSC Osnabrück is organising a number of special events on the occasion of the International 50th ADAC Hill Climb Race Osnabrück to thank active drivers for their great performance in the various competitions. On the Thursday before the 2017 race there will be a special highlight for all drivers: Together with Nettebad Osnabrück, MSC Osnabrück is inviting all drivers who have submitted their entry for the hill climb race to the new electric karting centre by the Nettebad swimming baths. 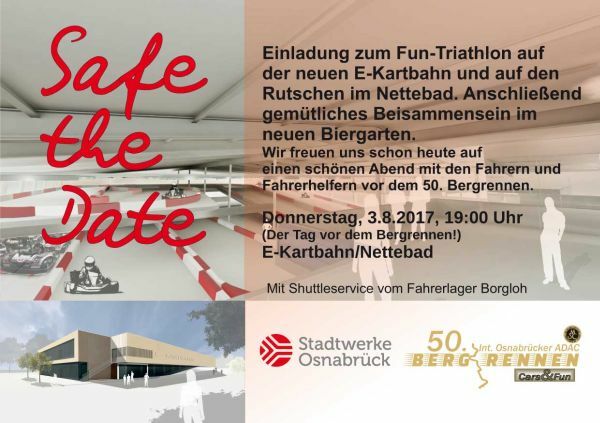 There will be a fun triathlon including, in addition to e-karting, a speed competition on two of the Nettebad’s spectacular water slides, followed by a podium ceremony and a party with live music in the large beer garden. Details of the e-karting event for drivers will be issued in the next few months and sent out together with the Supplementary Regulations of the Osnabrück hill climb race 2017. Jean-Pierre ‘Vande’ défait Bernard Munster et Geoffrey Leyon au terme de la Montée en Or ! Osnabrücker ADAC Bergrennen- Das Starterfeld ist komplett!